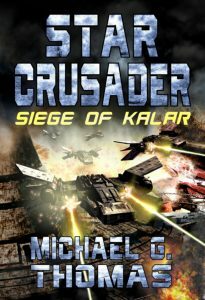 STAR CRUSADER BOOK 6 – RELEASED TODAY! STAR CRUSADER: SIEGE OF KALAR. Nate and his friends in Ironclad Squadron are returning to the fleet when they detect a mysterious signal. Sensing a trap, Colonel Gun sends Nate out alone in his captured fighter to scout the source. The signal is emitting from inside the heart of the abandoned Kalar Anchorage. This massive facility was once the Byotai Empire’s greatest shipyard, but now it lies cold and lifeless. Or does it? Upon arrival Nate runs headlong into the centre of a fierce battle. On one side are the numerous forces of the insidious Orion Interstellar Empire. On the other, the powerful attack cruisers of the Byotai outlaw, Warlord Katanga. Nate and his friends in Ironclad Squadron are returning to the fleet when they detect a mysterious signal. Sensing a trap, Colonel Gun sends Nate out alone in his captured fighter to scout the source. The signal is emitting from inside the heart of the abandoned Kalar Anchorage. This massive facility was once the Byotai Empire’s greatest shipyard, but now it lies cold and lifeless. Or does it? Upon arrival Nate runs headlong into the centre of a fierce battle. On one side are the numerous forces of the insidious Orion Interstellar Empire. On the other, the powerful attack cruisers of the Byotai outlaw, Warlord Katanga. Posted in BOOK NEWS and tagged Byotai, Kalar, science fiction, star crusader, star crusades.